We considered the impact of external influences on a GPS receiver and how these influences affect the capabilities of civilian-type GPS receivers. A standard commercial radio frequency signal generator and passive GPS antenna were used to test the sensitivity of GPS to intentional jamming; the possible effects of the terrain on the propagation of the jamming signal were also tested. It was found that the high sensitivity of GPS receivers and the low strength level of GPS satellite signals combine to make GPS receivers very vulnerable to intentional jamming or unintentional radio frequency interference. Terrain undulation was used to shield GPS antennas from the direct line-of-sight of the jamming antenna and this indicated that terrain characteristics can be used to mitigate the effects of jamming. These results illuminate the vulnerability of civilian-type GPS receivers to the possibility and the ease of disablement and establish the foundation for future work. The Global Positioning System (GPS) was initially designed for military use, but civilian applications have grown in diversity to such an extent that the number of civilian users and civilian applications exceeds those of the military. Receivers that utilise the Standard Positioning Service (SPS) are found in vehicle, aircraft and shipping navigation solutions. In the banking and information technology fields, GPS is used as a time device to synchronise servers and transactions. The recreational market has contributed significantly to the number of uses of GPS. Receivers which use the SPS are used in the South African National Defence Force (SANDF) for navigation, timing and positioning. These GPS receivers range from low accuracy handhelds used by infantrymen to more advanced receivers that are used on weapon platforms as part of integrated navigation systems. In this case the dependency on GPS is limited. In addition, the SANDF uses a small number of survey quality GPS receivers that utilise both the L1 and L2 carrier signals for positional data. As navigational information is a critical component of military operations and the maintenance of the military's operational and logistical systems (e.g. mapping and spatial databases), it is important to understand the capabilities and limitations of these civilian-type GPS receivers. The GPS is a space-based navigational system. At least 24 satellites orbiting the earth at a mean distance of 26 600 km from the centre of the earth are transmitting radio signals that propagate through the atmosphere at the approximate speed of light. These signals are used by a GPS receiver to determine a position on earth by converting the known positions of the satellites to a single position on earth. This determination is made possible by using the known speed of these signals from each satellite multiplied by the time it took to reach the receiver. The intersection of these signal vectors allows the receiver to determine a position on a reference ellipsoid that is a close representation of the earth's shape. Software conversion packages are used to convert this position on the ellipsoid to a three-dimensional position on earth which may have an error in the range of 10 m to sub-centimetres. In reality, this process is far more complex, but this simplification suffices to create an understanding of the basic concepts involved. It is important to understand how to mitigate (or recognise the presence of) these influences which impact on the reliability of civilian-type GPS receivers. Knowledge of these influences, and the adoption of specific navigation approaches, can allow these receivers to be used with confidence. However, another serious impact is the susceptibility of civilian-type GPS receivers to jamming or selective denial. 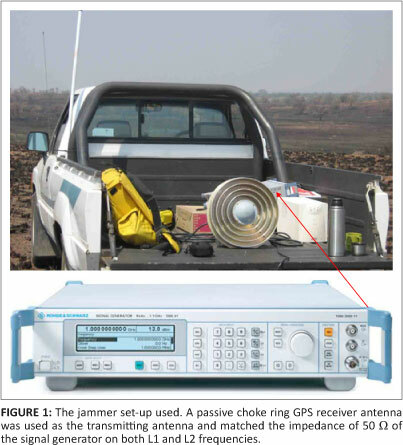 GPS jammers can be bought on the market for private use.10,11,12 As the SANDF is using civilian-type GPS receivers, which are relatively (to encrypted P(Y)-code capable military receivers) more susceptible to jamming techniques, jamming is a very relevant challenge. Although jamming is a military concept the extensive civilian use of GPS has brought it also into the ambit of safety of life applications, such as public air and rail transport. There is also the possibility of unintentional disruption of GPS satellite signals. Examples of typical radiolocation services which could cause interference include air traffic control radars and electronic aids for air navigation. These services transmit on frequency bands close to the L2 frequency and the intended L5 frequency. It is inevitable that some of the out-of-band energy from these signals in adjacent bands or energy resulting from the malfunctioning of these transmitters will interfere with the reception of GPS receivers. There is even evidence that television transmissions have disrupted GPS receiver functioning. The modernisation of GPS by adding the L2C and L5 signals is an effort to improve the reliability of GPS. The susceptibility of civilian-type GPS receivers to jamming was tested by means of a rudimentary set-up consisting of a Rhode and Schwarz SML-B3 radio frequency signal generator (Hamburg, Germany) connected to an omnidirectional choke ring GPS antenna (Jet Propulsion Laboratory, Pasadena, CA, USA). This signal generator can generate signals in the spectrum from 9 kHz to 3.3 GHz with an output level of -140 dBm to +19 dBm. For the purpose of these tests, the antenna was tilted in the horizontal plane (Figure 1) to project the jamming signal in a specific direction in order to control some of the signal emissions for measuring purposes. The signal generator was set to generate a frequency modulation (FM) signal on the L1 band at 1575.42 MHz and the signal output strength was varied in stages between -3 dBm and 17 dBm. Four civilian-type GPS receivers were used in these tests: a Topcon GB-1000 (Livermore, CA, USA), a Trimble ProXH (Sunnyvale, CA, USA), a Garmin 60CSx (Kansas City, MO, USA) and a Garmin eTrex Legend HCx. In the initial test the jammer was adjusted to provide an output level of +13 dBm. The GPS receivers were carried in a north-easterly direction away from the jammer. The jammer was able to disrupt all GPS receivers to a distance of approximately 2 km close to the 'threshold' at which the jammer had no effect. Points 1 to 4 in Figure 2 indicate the positions where the Garmin 60CSx and the eTrex GPS receivers could obtain a position. 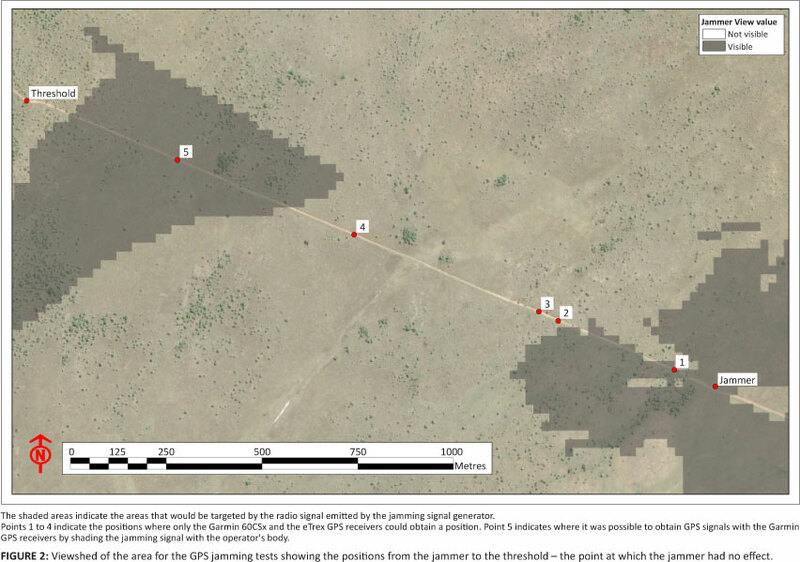 These positions are in 'dead ground as illustrated in Figure 2 and indicate the shading effect of the local terrain. Both the Trimble and Topcon GPS receivers could not establish any position in this test. At the position of Point 5 it was possible to obtain GPS signals with the Garmin GPS receivers by shading the jamming signal with the operator's body; closer to the jammer it was not possible to do so. The shading effects of other objects, such as a zinc pail and a stainless steel bowl were also estimated by placing the GPS receiver inside the pail or bowl, effectively screening the receiver but of course limiting sky visibility and access to GPS satellites. In this test the zinc pail did not protect the GPS, but the stainless steel bowl was very effective and protected the GPS within a few metres from the jammer's antenna. The metallurgic compositions of these objects were not evaluated; this test was rudimentary and needs to be followed up with more controlled laboratory tests to establish how a jammer's signal can be effectively shaded with other objects when terrain does not render sufficient protection. Many factors play a role in the shielding process, including the shape and size of the shading device, which influence its interaction with the jamming signal. The GPS receivers were then deployed on the 2 km threshold and were allowed to lock on to the available GPS satellites to establish a position. At the time of measurement, 12 GPS and 5 Russian GLONASS satellites were available. The signal generator output power was set to -3 dBm and progressively increased until the different receivers could not establish a position. A general observation was that the Garmin eTrex, although a less sophisticated receiver than the Garmin 60CSx, exhibited better resistance to jamming than the Garmin 60CSx. The Trimble ProXH performed the best out of the receivers, which can be attributed to its Zephyr antenna design (which rejects multipath signals and thus the Trimble may be less sensitive to low elevation signals transmitted by the signal generator). The more sophisticated receiver, the Topcon GB-1000, was the easiest to jam on lower power levels (receiver sensitivity plays a role here). 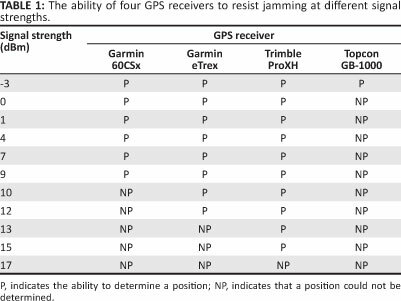 Table 1 lists the receivers' abilities to attain a position at different jamming signal strengths. These tests were conducted to indicate how easy it is to jam civilian-type GPS receivers. Using more appropriate equipment, such as directional antennas, together with higher signal outputs, could render more significant results. Jamming is dependent on line of sight and terrain can shade the GPS receiver. However, the deployment of a number of aerial jammers (e.g. located on balloons) could neutralise both the shading effect of the terrain and the directional effect resulting from the jamming signals being transmitted from one direction only. These factors would make countermeasures more difficult. Thus, the possibility to jam or spoof civilian-type GPS receivers and the implementation of possible protective measurements need to be investigated further. Unintentional jamming of GPS receivers by radars used in the SANDF that use the L-band was also tested, using two such radars - the ESR 220 or Kameelperd and the Tactical Mobile Radar. It was found that neither of these radars influenced the GPS receivers to the extent that the receivers could not establish a position. The signal-to-noise ratio that indicates the strength of the GPS satellite signal at the receiver was not noticeably influenced. It was only with measurements next to the Kameelperd that some influence could be observed, but this influence was not sufficient to prevent the receivers from establishing positions. It can therefore be deduced that these radars will not influence or jam GPS receivers during operations. We have demonstrated that the reception of GPS signals by civilian-type GPS receivers can be disrupted easily with rudimentary equipment. Although it was demonstrated that terrain can provide masking against a ground based jammer, low-cost aerial jammers would pose a significant challenge. Worldwide there is a drive to improve the reliability of the GPS for safety of life applications, such as civil aviation, that will also benefit military applications. Jamming remains a serious threat to the integrity of navigation that needs further investigation and special measures need to be developed to protect against this threat. Such developments are even more important, when it is considered that the SANDF plans to conduct decisive actions by means of night operations when navigation is significantly more difficult. We would like to thank the Chief Directorate National Geospatial Information for providing a digital elevation model that was used in the terrain model; the South African Space Agency (formerly the Satellite Application Centre) for providing the Spot 5 satellite image as a backdrop for the terrain model; staff of Directorate Geospatial Information for assisting with the jamming tests, the personnel at the Mobile Deployment Wing, including the Reutech personnel that assisted with the jamming test with RADAR; and Special Forces for the use of the Generaal Piet Joubert training area for these tests. A.F.v.N. conducted the tests and processed the data as part of his MSc research. L.C. supervised the research and participated in the analysis and interpretation of the data. Both authors contributed to the writing of the manuscript.